A. The green light is due. Do not proceed until the green light appears. B. You may carefully drive through the crossing, if there is no risk of colliding with pedestrians. C. The traffic lights are out of order and pedestrians must not use the crossing. Correct. You may proceed through the crossing if there is no risk of collision. 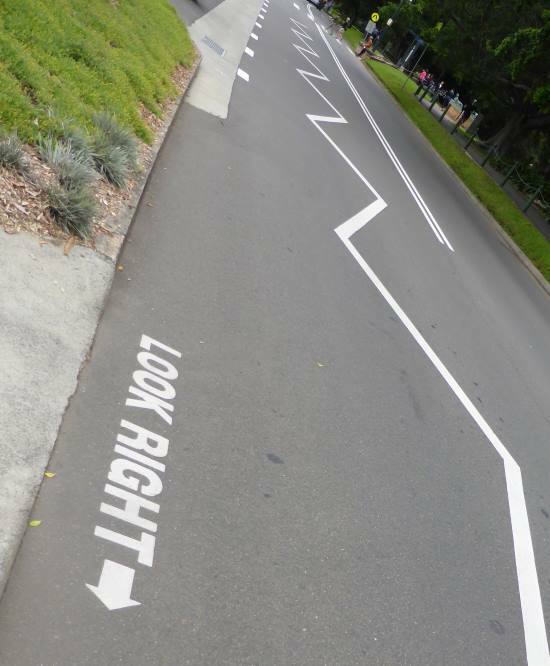 Special markings on the road show where pedestrians have rights to cross and you must give way to them. You must also give way if you are turning and they are crossing the road. You must also give way even if there is no marked crossing if you are in danger of colliding with them. If a vehicle has stopped at a pedestrian crossing you are not allowed to overtake it. The most at-risk pedestrians are children (because they have less road sense) and the elderly (who often can't move as quickly), and when there is poor light pedestrians are much more difficult to see, especially if they are wearing dark clothing. There are six main types of crossings: two with signals, one with flags and three without signals. These are controlled by traffic lights, but have a different colour phasing to normal lights. After the red light the amber lights flash and the pedestrians see a flashing red 'Don't Walk' sign. If there are no pedestrians on the crossing you can cross on the flashing amber. After the flashing amber, a green light will display, and the Don't Walk sign will be illuminated for pedestrians. At traffic lights pedestrians can push a crossing button and wait until the lights for vehicles go red. After vehicles have stopped a green man will show and pedestrians can cross if it's safe (it still pays to check that vehicles have seen their red light. The red man will then flash before the lights for vehicles go green. 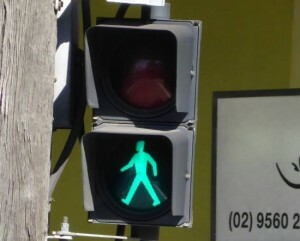 Pedestrians must not start to cross when the red man or 'Don't Walk' is shown, and they must not start to cross when the red man or 'Don't Walk' starts to flash. Vehicles turning into that street must give way to pedestrians already crossing. For blind pedestrians there may also be an audible cue that the crossing light is green. At a pedestrian crossing with traffic lights, when the amber light starts 'flashing' after the red stop signal, it means you may carefully drive through the crossing, if there is no risk of colliding with pedestrians. If the lights are red you must stop and wait for pedestrians to cross. These are temporary or part-time crossings usually near schools that operate just before and just after school hours, during school excursions and at lunch times. They are highlighted with red or orange flags with the words Children Crossing on them. You must not proceed across the crossing until all pedestrians are off the crossing. You must not stop within 20m before and 10m after the crossing. When approaching a pedestrian crossing be ready to stop and give way - sometimes pedestrians are hard to see and one might just step out in front of you. Elderly and disabled people could need extra time to cross, so be patient. This is a marked area of the road with white stripes. It is usually seen on single carriageways. 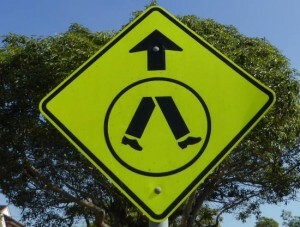 They will be marked by a yellow sign showing legs. 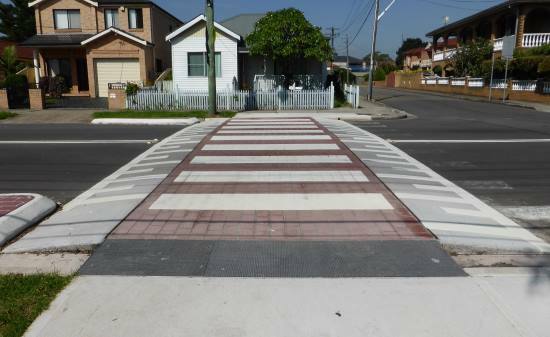 Some crossings will be raised like the one in the picture, and this encourages drivers to slow down before they get to the crossing. 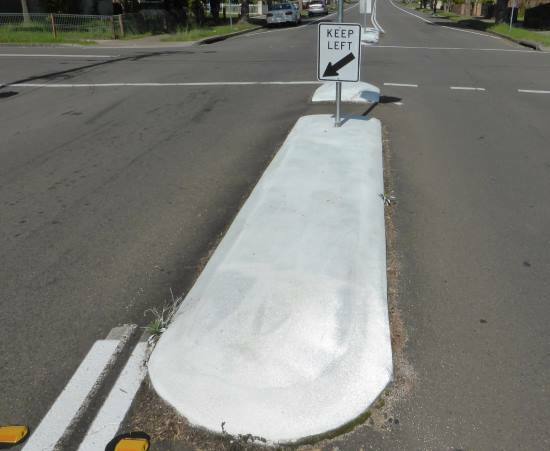 The raised part is marked with white paint. If there are zig-zag lines on the road before the crossing this means you're approaching a crossing with limited visibility, so take extra care. 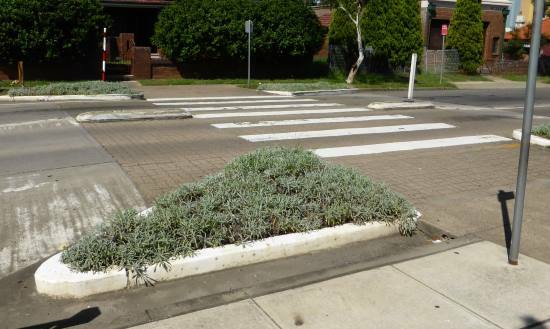 The following image shows such a crossing in the Botanic Gardens in Sydney. This is where there is no marked pedestrian crossing but there is a centre refuge to protect pedestrians, and to prevent vehicles from cutting across a junction, for example. Shared Traffic Zones aren't crossings, but they are areas where pedestrians and vehicles share the road. They have a speed limit of 10kph. A School Crossing Supervisor will hold a stop sign like this and you must wait until the children are off the crossing and the hand-held sign is taken away. Watch for these during the hours that children are travelling to and from school, plus lunchtimes. All the DKT questions about pedestrians can be found here. Pedestrians will sometimes cross where there are no marked crossings. Take care in the evenings and nights when they are not as easy to see. On Thursday-Saturday night, there tends to be more drunk pedestrians walking around and they will be less able to judge your speed. Pedestrians are generally looking for the shortest route and they will cross in front of and behind buses and light rail trams after they have got off, and anywhere where it's convenient rather than safe. They will often hurry when it's wet weather and their view might be partially obscured by an umbrella or raincoat hood.